The 2017 Volkswagen Golf is not only a practical and versatile hatchback but also serves as a stylish and sporty vehicle that quickly beats out the competition. Modern and sophisticated the VW Golf appeals to just about any customer that could benefit from a spacious hatchback with fun to drive performance features. Find out how the 2017 VW Golf sets the bar for other hatchbacks on the market and read more on this stylish and affordable model. The 2017 VW Golf is powered by a 1.8-liter TSI four-cylinder turbocharged engine that produces 170 horsepower. The power behind the Golf gives the hatchback a quick response and precision handling which makes driving through the streets exciting. While the performance and sharp response of the 2017 VW Golf excites many owners, the added fuel economy just makes it that much more desirable. The 2017 Golf gets an EPA estimated 25 city mpg and 36 highway mpg. Who doesn't love the added bonus of safety? 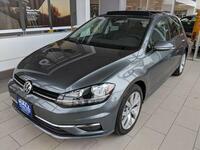 With the 2017 VW Golf owners are driving a hatchback that was awarded the National Highway Traffic Safety Administration's highest rating of 5 stars. The 2017 Golf features a rigid safety cage, an Intelligent Crash Response System and Automatic Post-Collision Braking System. Along with safety features and a strong exterior, the driver-focused interior lets the driver remain focused on the road for safe driving with no distractions to reinforce the Golf's safety. The 2017 VW Golf is connected to all of the greatest technology features as well including Apple CarPlay and Android Auto, which makes smartphone connectivity as easy as plugging in your phone. Customers will also enjoy the standard rearview camera, VW Car-Net App-Connect, panoramic sunroof, heated seats, leather upholstery and much more. The 2017 Volkswagen Golf is available now at Hall Volkswagen in Brookfield. Call us today to schedule a test drive!